Programs are free and open to the public unless ticket information is noted. See Me at SAAM is an interactive program designed to improve the well-being of individuals with dementia and their care partners by experiencing and discussing art in a small group. Tickets: Free; Registration required. Please email access@si.edu or call (202) 633-2921. Saturday, April 6, 11:30 a.m. – 3 p.m.
Did you know that orchids live on every continent except Antarctica? Visit the Kogod Courtyard to explore Orchids: Amazing Adaptations, a joint installation presented by SAAM, the National Portrait Gallery, Smithsonian Gardens, and the U.S. Botanic Garden that fills the space with hundreds of orchids of stunning variety. Make your own paper orchid to take home, enjoy tasty orchid-inspired treats from the Courtyard Café, and learn how orchids have adapted to diverse habitats. Explore the influence of mass media on American art and politics during the Vietnam War era in this conversation between Melissa Ho, SAAM’s curator of twentieth-century, and Harry R. Rubenstein, curator emeritus of political history at the National Museum of American History. Presented in conjunction with SAAM’s newest exhibition Artists Respond: American Art and the Vietnam War, 1965–1975, Ho and Rubenstein expand on some of the central themes permeating throughout the exhibition. Ceramicist Sharif Bey, one of the artists featured in the Renwick Gallery’s exhibition Disrupting Craft: Renwick Invitational 2018, shares insight on his work and creative process during this gallery talk. Pick up some tips from Bey as he provides a demonstration, then get a feel for the clay yourself in a small hands-on workshop. Space is limited to the first 25 attendees. Saturday, April 13, 11:30 a.m.
Let off some STEAM with new hands-on activities at the Lunder Conservation Center! Explore firsthand how science, technology, engineering, and math intersect with art in conservation. Bring your mat and relax with this Vinyasa yoga and art appreciation series. Participants are invited to reflect on an artwork of their choosing before a credentialed instructor from Flow Yoga Center leads a one-hour, all-levels class surrounded by the beautiful artworks in the Luce Foundation Center. Visit old favorites and discover new treasured artworks in Connections: Contemporary Craft at the Renwick Gallery. Learn how we care for and restore these pieces from SAAM’s objects conservator Gregory Bailey and graduate intern Leila Sabouni. Want to deepen your understanding and appreciation of contemporary art? Join Joanna Marsh, senior curator of contemporary interpretation, for this popular ongoing series of gallery talks. Marsh uses a single artwork from the museum’s collection to spark conversation and greater discovery. Join Disrupting Craft: Renwick Invitational 2018 artist Dustin Farnsworth as he talks about the evolution of his work and explains how he addresses social issues with his pieces. Learn how the economic struggle in his hometown of Lansing, Michigan has influenced his work and how he develops partnerships to further explore our changing society by giving voice to those who are not always heard. Friday, April 26, 12:15 p.m.
Take a lunch break and join SAAM’s research fellows as they share their new discoveries about artworks from the collection. For this installment, research fellow Renée Ater will discuss Joe Minter’s The Dreamer. Come learn the stories behind this artwork and find out what it tells us about America’s ever-changing culture. Sunday, April 28, 1 p.m. Hear expert botanists from Smithsonian Gardens explain the craft of caring for a plant, then follow along with a flower demonstration that sharpens your own creative skills during this hands-on activity. Saturday, April 13, 4 p.m.
SAAM’s newest exhibition Artists Respond: American Art and the Vietnam War, 1965–1975 examines a harrowing and formative period in America’s history. The Consort, SAAM’s contemporary classic ensemble-in residence, mounts a musical response to the exhibition with works that speak to the tenor of the times and the pervasive cultural impact that still radiates from them. In conjunction with SAAM’s exhibition Artists Respond: American Art and the Vietnam War, 1965–1975, SAAM presents this harrowing film by documentary filmmaker Peter Schoendorffer. A veteran of the Indochina War between France and Vietnam, Schoendorffer returned to Vietnam in 1966 where he and a cameraman embedded with a 33-man platoon from the 1st Air Cavalry Division led by Lieutenant Joseph Anderson. This film focuses on the American soldiers, their adjustment to a profoundly foreign environment, and the day-to-day realities of war against an often unseen adversary. A conversation with Lieutenant Joseph Anderson follows the screening. Not Rated (65 min; 1967). Join vocal artist Cecily Bumbray for a special performance rooted in a deep appreciation for mid-century soul, jazz, ’90s R&B, and reimagined folk music. Known for her sweet soprano, honest lyrics, and pure vocals, Bumbray brings her own vulnerability to each song. With a father who loves Miles Davis and a mother who adores Smokey Robinson, Cecily grew up surrounded by the music of their vast record collection and shares this rich love of music with her audience. Friday, April 19, 5:30 p.m.
Luce Unplugged showcases up and coming local bands surrounded by beautiful artworks in the Luce Foundation Center. In this installment, We Were Pirates explores themes of love, pain, and the search for peace of mind in their mellow, electronic tunes. Libations and snacks are available for purchase at the on-site bar. Draw inspiration from artists’ sketches as well as the thousands of objects on display in the Luce Foundation Center of the Smithsonian American Art Museum, then spend time sketching in our workshop. Some materials provided; please bring a small sketchbook and pencils. Wednesday, April 3, 10, 17, 24, 3 p.m. Learn how museum conservators preserve SAAM’s artworks in the Lunder Conservation Center. The center has five state-of-the-art laboratories and studios equipped to treat paintings, prints, drawings, photographs, sculptures, folk art objects, contemporary crafts, decorative arts, and frames. Group size is limited. Sunday, April 11, 28, 5:30 p.m. and 1 p.m.
Join us for lively gallery conversations in American Sign Language led by Deaf gallery guides. For more information, email CohrsG@si.edu. 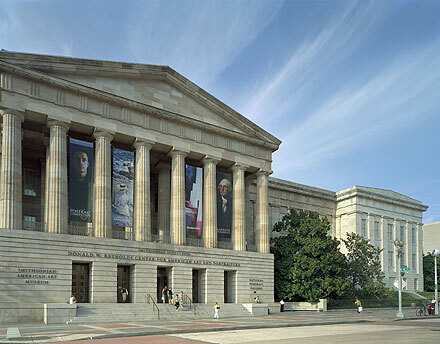 Sunday, April 14, 1:30 p.m.
Thursday, April 18, 3:30 p.m.
For more information on this museum, visit our Smithsonian American Art Museum page.